This device sits in front of your keyboard, eliminating the reach for the mouse (to the right or left of the keyboard). 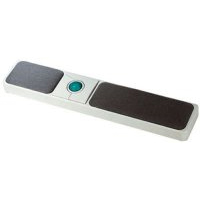 Ideal for individuals who are slight of build and need to reduce their reach for the mouse. There is a small form factor gel wrist pad, which will support your palms whether or not you are actively typing. The low-profile trackball nestles between the dual wrist rests and may be used for easy point, click, and drag operations in all Windows' software environments. This keyboard is a 104 key keyboard with a huge built-in trackball for mousing (51 mm or just over 2 inches in diameter). The keyboard has tactile (i.e. you can feel the click when the key actuates) mechanical keyswitches rated at 20,000,000 life cycles. The dimensions of the keyboard are 19.1" Long x 6.8" Wide x 1.3" High. This keyboard comes with a single dual head PS/2 cable for keyboard and mouse, and a USB adapter which permits you to fully use the keyboard with only one USB port. 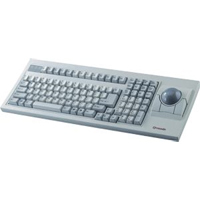 The Libra-90 from iOne is a large button trackball using quality opto-mechanical technology. The microswitches on the buttons are tactile and the retaining ring around the ball is removable, making for easy roller cleaning. It also comes with a detachable wrist support pad.